Last week we released one of our biggest updates to the Happyfeed App. We rewrote the code on most of our pages and added a few big features to make it even more fun to use. The more you use Happyfeed, the more happy moments you are collecting. We want to make scrolling, tapping, swiping, and zooming through these moments an absolute joy. There’s something incredibly powerful about having a journal full of only your happiest moments, and in this version of Happyfeed, we really wanted to make that our focus. You might not see any major differences on the new homepage. That’s because posting on Happyfeed has always been our simplest and best feature. We wanted to improve the look without losing any ease-of-use. The first thing you might notice is the new navigation bar on the bottom. We threw out the old green (too much green!) and updated the icons to be more appropriate for each page. Additionally, we updated the “1 month ago…” button look, improved the spacing a little, and added little dots to make it easier to know which day you’re on. And if you’ve been using the “Especially wonderful day?” button, you’ll notice we updated that as well. Since we are introducing a calendar for Plus subscribers, we thought we better make some big changes to the history view as well. The main goals were to make it cleaner, clearer, and more fun to scroll through. 🗂 Grouping by Day - Each day is now separated by a green line and text. 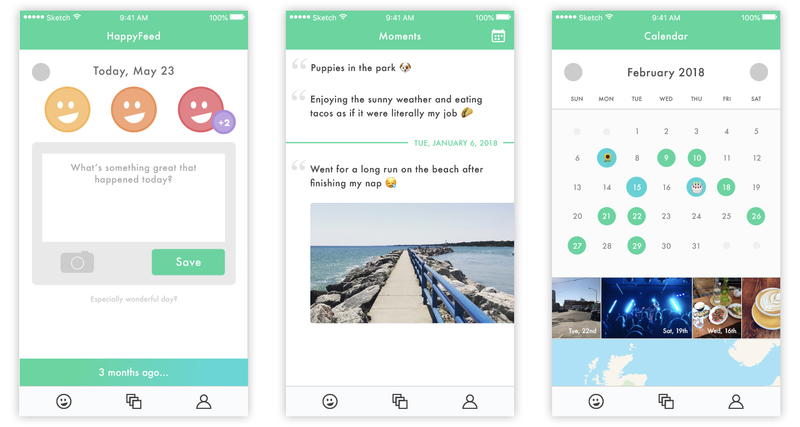 This saves space by not repeating dates and makes it easier to see which moments go together. ✨ Image loading - All the images throughout the app now load in with a fade effect. It makes scrolling feel smoother and much more pleasant. 📐 Text sizing: We added a little spacing and now use a bigger font for short posts. If you just want to post the name of your boyfriend or girlfriend, we want that to pop out just as much as a snapshot of the ocean. After posting on Happyfeed for even a week, looking through your past moments is one of the most fun parts of the app. We hope that feels even better with these changes! The calendar is by far the most complicated addition we’ve made to Happyfeed in a long time. It’s the first time we’ve explored using location data and new ways to think about your past posts in the app. 📍 Map view - Below the image slider, we (finally) added a map of your moments. 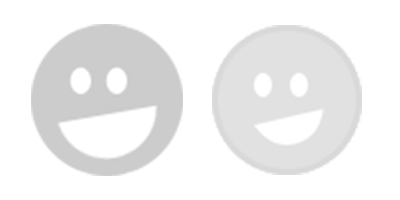 Location tracking has been an optional feature for a long time, and now you can actually see where you were when you posted your happy moments. 👀 Focus on exploration - If you wanted to see a post from last March, it would require a LOT of scrolling before. Now you can just tap on the month title and select the month you want to look at. It’s quick, easy, and gives you all the control. We’ve been pondering paid versions of Happyfeed for years. Mostly - how can we generate revenue to cover our costs and grow our team without sacrificing any of the happiness created by our app? We decided it was important that the free version of Happyfeed will always be available and will never lose any features. So, we called the subscription “Plus” because it’s just the same version of Happyfeed but with extra features to make the experience even better. Some of these features make it more expensive to run our company (server costs, etc) so it felt natural to ask for a small monthly fee. Not only did we polish up the face of Happyfeed, but we rewrote most of the application code to make it easier for us to add new features and make updates in the future. We’re building the infrastructure for something we hope to use ourselves in 30 or 50 years from now, and it’s important we do that right. Thanks for reading and thank you for supporting us even if just by trying out the app! We can't wait to share even more updates soon.